You work as DBA at Certkiller .com. You administer two Windows Server 2003 computers named Certkiller A and Certkiller B. You install SQL Server 2005 on both Certkiller A and Certkiller B to host a new company database. Certkiller A hosts a read-write copy of the company database in which all changes are made. Certkiller B subscribes to a publication on Certkiller A and is only used for reporting. A Windows domain administrator provides you with a domain user account named SQLSRV to use as the security context for the SQL Server services. A password policy of 42 days exists in the Default Domain Group Policy object (GPO). You install the database on Certkiller A and Certkiller B and configure replication. Everything works fine for six weeks, but then all SQL Server services fail. You need to correct the problem. C. Create a local user account on Certkiller A named Certkiller A and a local user account on Certkiller B named Certkiller B. Configure Certkiller A and Certkiller B to run under the context of the appropriate local user account. 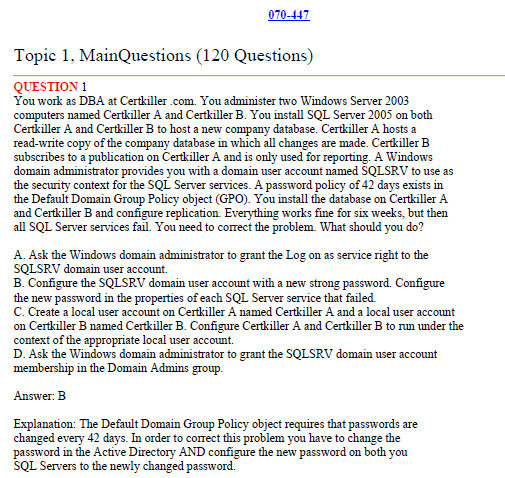 D. Ask the Windows domain administrator to grant the SQLSRV domain user account membership in the Domain Admins group. Explanation: The Default Domain Group Policy object requires that passwords are changed every 42 days. In order to correct this problem you have to change the password in the Active Directory AND configure the new password on both you SQL Servers to the newly changed password.